Don't worry readers, I didn't give my just-turned-three-year-old a needle and a pair of sharp shears. But I did let her use toddler-appropriate kiddie scissors, and I was really impressed with how carefully she cut out her pattern pieces! Let me step back for a moment. Twenty-three years ago my brother (then seven) and I (10 at the time) got a really fantastic Christmas present from our sewaholic mom -— doll-making kits. 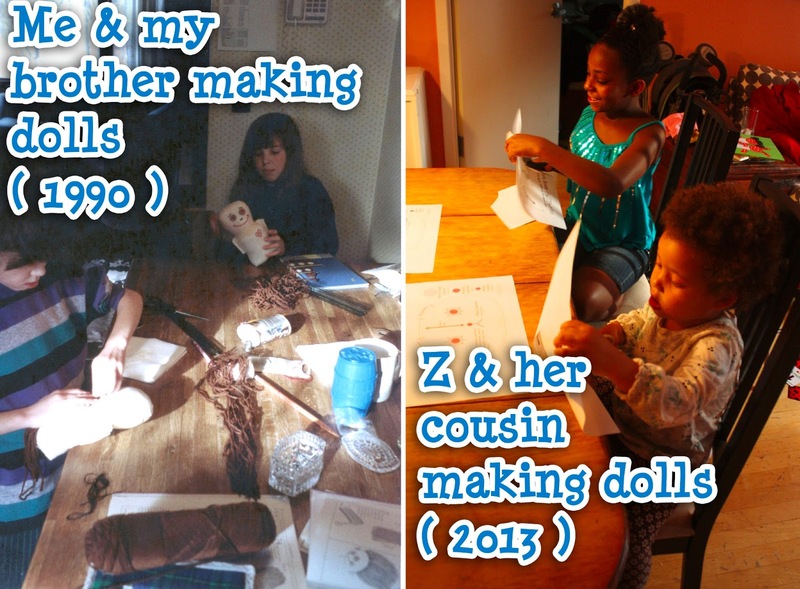 We spent a couple of days sitting around the kitchen table carefully dying our doll fabric with tea, cutting out our pattern pieces, embroidering the faces, sewing on hair, and stitching the seams by hand (see photo at top). It was awesome, and I loved every minute! 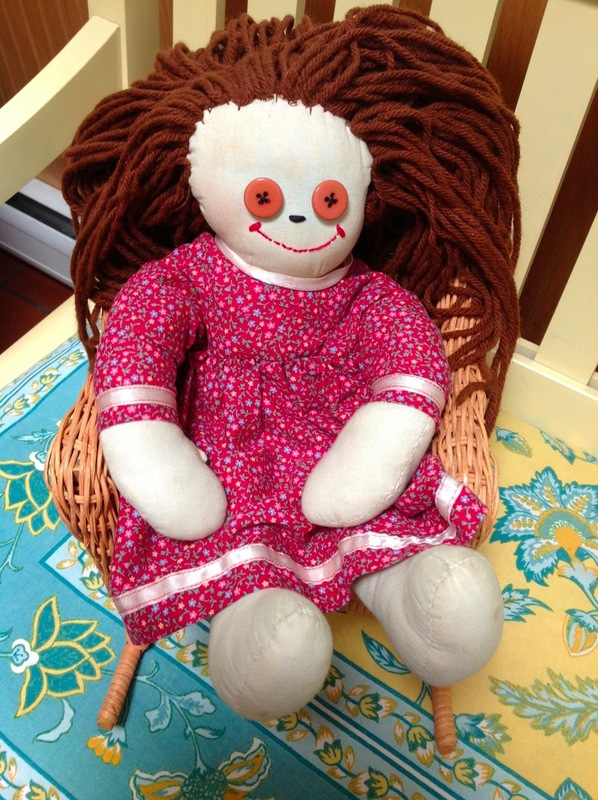 My mom still has "Annie," one of the finished dolls at her house. Anyway, when my niece T came to stay with us for a week recently, she asked if I could help her fix a split seam on her travel pillow. Instead of sewing it for her, I handed her a needle and thread and showed her how to use them... and was impressed at how quickly she figured it out and sewed a sturdy little seam on her pillow. T was so excited by her success, I decided to give her a more fun project. 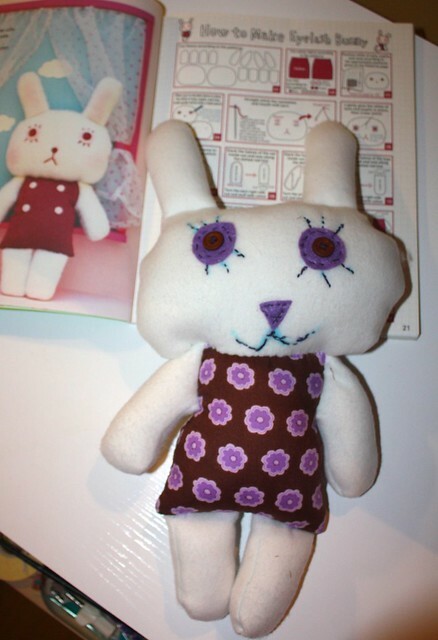 I gave her a little Japanese doll sewing book and she picked a moderately challenging doll pattern. Little Z couldn't be left out, so I promised to let her make the same pattern. Fabric & notions: I let the girls choose fabrics from the stash. 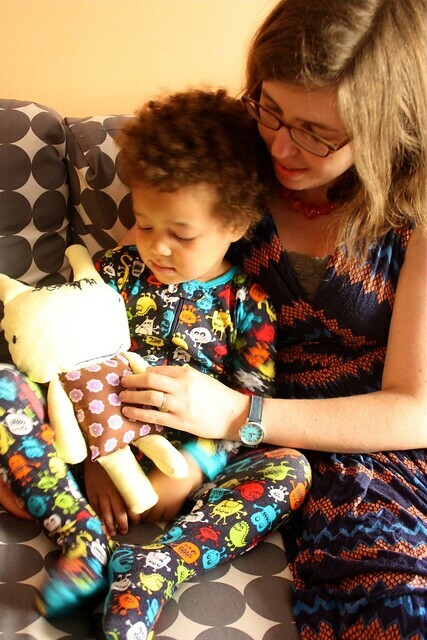 T made her bunny body out of a stretchy white fleece from an old blanket, and the dress from a lovely floral cotton I had picked up a few years ago in Portland at the Bolt modern fabric shop. 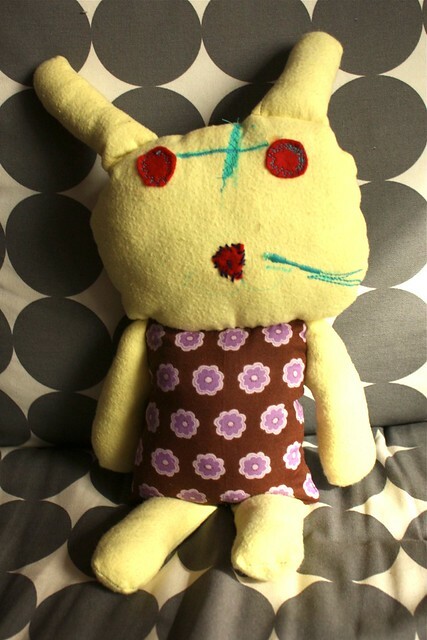 Z chose some yellow cotton flannel left over from diapers my mom made her a few years ago, the same floral for the body, and some red felt for eyes. 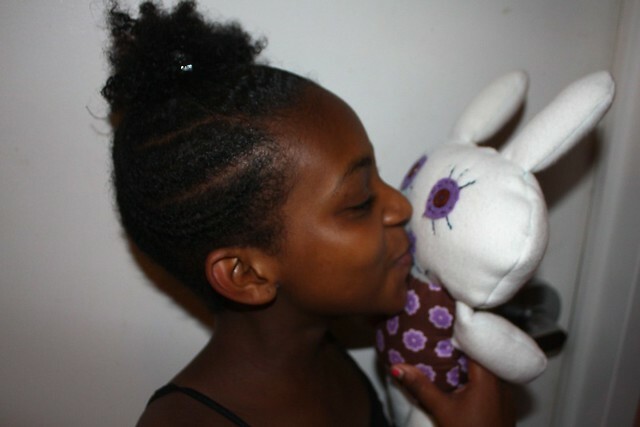 Her Nana Gail helped her cut out most of the fabric pieces, T stuffed the doll and I sewed it together. 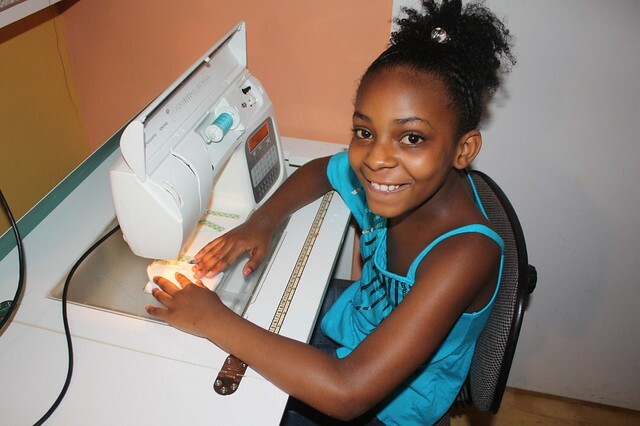 Have you ever taught anyone to sew? What was your experience? P.S. I finally got around to setting up a Facebook page for Polka Dot Overload... will try and cross-post everything there if you prefer to follow me that way! My three-year-old loves to hang out with me when I sew. I give her a threaded needle, knotted so it won't come out of the eye, and scrap fabric. She has a lot of fun stitching it all together in a muddled mess. And it gives me a bit of time to finish a few more seams. That's awesome! That's kind of how little Z "knits." I bought her some kids' knitting needles and she just stabs the ball of yarn repeatedly until it's all tangled up. I'm giggling over here imagining that. I might have to try that with my li'l one, but knowing her she might just strew it around the house. What a great blog post, Mikhaela. 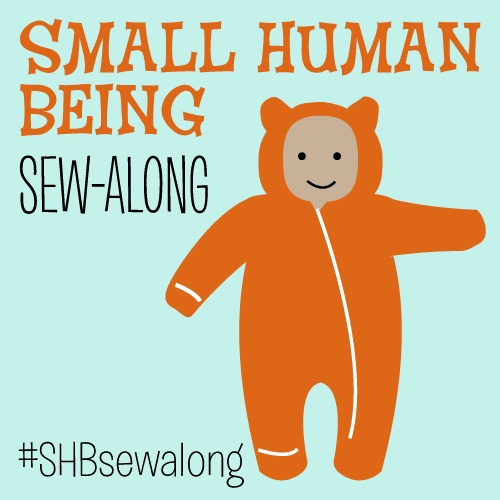 I have never tried to teach anyone to sew but your post made me want to. Love that Annie doll! thanks Peter! I think Annie was missing an eye at one point but my mom must have found it... I think that's the one my brother made, as mine was named "Maggie." 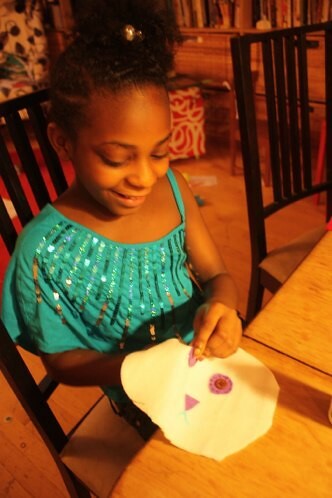 I have only taught adults to sew and their faces didn't light up with excitement like your niece's does. ha, yes! When I have taught adults to knit it wasn't quite as fun... there was excitement at first but not at the same level, and they were more easily frustrated and trying to doing everything just perfect. So sweet!! I love that picture of you and your brother! The girls' dolls turned out so cute! I think that would be awesome! 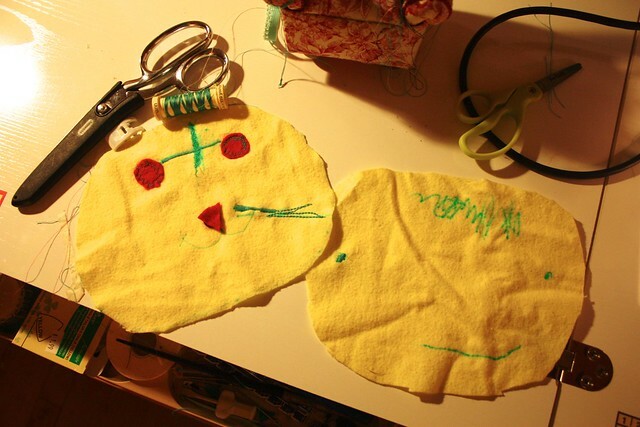 It's a really fun project for kids... it can be as complicated or simple as you want it to be. 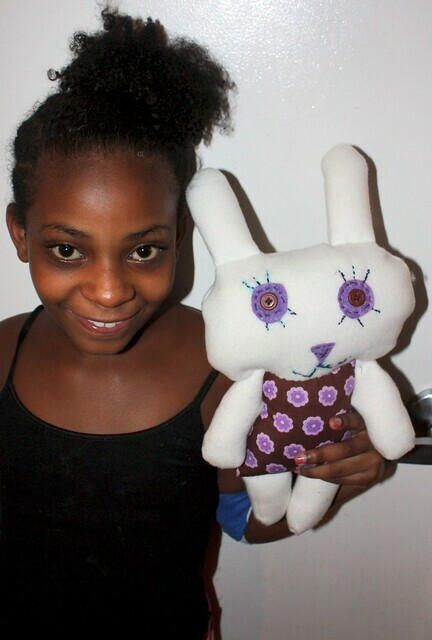 LOVE teaching kids to sew! They do have such enthusiasm. Looks like you've started something now! What great fun! They are adorable girls and made adorable little bunnies. I need to do this with my little one! She loves watching me sew, but does always want to help:). Time to let her get to it. How fun! They both look so proud of their bunnies! This post is so incredibly cute, oh my goodness. Sewing is so removed from our lives now that it's fun to see someone realize that they can totally make something and it's really not that hard. Those dolls turned out so cute!